Tag line: "A spectacular aerial view of a legendary land"
Like Over Ireland, 2005’s Visions of England, the 13th entry in the Visions of Europe series that was initially broadcast on public television in the U.S., visits several of England’s most impressive landmarks, giving us a glimpse at what they look like from a few hundred feet in the air. 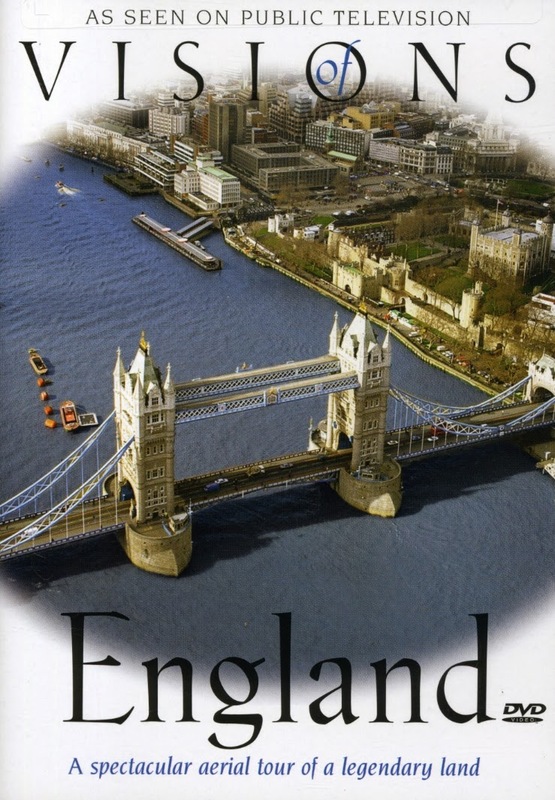 Narrated by Franca Barchiesi, Visions of England takes us on an aerial tour of the country, from the White Cliffs of Dover to the remnants of Hadrian’s Wall and plenty of places in-between. Swooping over such scenic locales as the Isle of Wight (including a stop at Osborne House, where Queen Victoria spent the last 40 years of her life); Stonehenge (which is just as magnificent from above); Stratford-upon-Avon (home of Shakespeare); and London (where we remain for the final third of the movie), this made-for-TV special covers many of England’s best-known attractions (the London Eye and nearby Parliament) as well as some I’d never heard of before, like the Uffington White Horse, a 110 m (374 ft) long prehistoric-style figure carved into the side of a mountain and filled in with chalk, a wonder almost as mysterious as Stonehenge (the entire thing can only be seen from above, meaning the people who created the Uffington Horse 2,000 years ago never got a chance to view it in all its glory). At just under an hour, there simply wasn't enough time for Visions of England to visit every corner of the country; personally, I’d have loved to see what Stamford (a town in Lincolnshire situated on the River Welland) looked like from the air, not to mention Peterborough Cathedral (which, among other things, is the final resting place of Catherine of Aragon, the first of Henry the VIII’s six wives). Still, despite its limitations, Visions of England is a picturesque journey through a land steeped in history, and its unique vantage point makes it a documentary that’s as beautiful as it is informative.